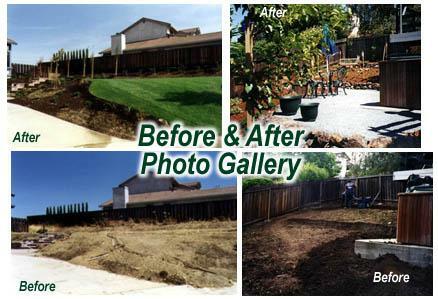 The "Before & After" Photo Gallery contains photos of various landscaping projects, comparing what the property looked like before we began work and then after the work was completed. The particular properties are indexed in the menu on the left by City Name, Property Number, and Yard Location. Please click on the menu item to bring up the respective page(s) containing the photographs and work descriptions. Please be aware that each menu item may contain multiple pages. You can go to the next page in the series by clicking on the "Next Page in Series" button. All web pages and material © copyright by Howell Landscape, Walnut Creek, CA.